Te Kuiti is a small town in the south of the Waikato region of the North Island of New Zealand. 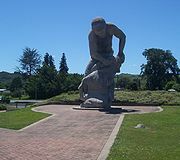 It lies at the junction of State Highways 3 and 30 and on the North Island Main Trunk Railway, 70 km south of Hamilton. As of the 2001 census it had a resident population of 4,374, a decrease of 5.1% since 1991. The town promotes itself as the sheep shearing capital of the world and is host to the annual New Zealand National Shearing Championships. 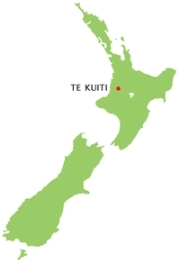 Te Kuiti is approximately 80 km south of Hamilton and 19 km south-east of Waitomo. The area around Te Kuiti, commonly known as the King Country, gives its name to the Heartland Championship rugby team based in Te Kuiti. Te Kuiti is the Maori name given to the area. In its original form of "Te Kuititanga", it literally means "the valley", "the squeezing in" or "the narrowing". The "Shearing Capital of the World" contains the world's largest shearer, seven metres high. On April 1, 2006 the largest sheep show in the world took place here, with more than 2000 sheep. The carved Te Tokanganui-A-Noho Meeting House was gifted to the local Maori people (Ngati Maniapoto) by Te Kooti, a famous Maori leader. The Tatsuno Japanese Garden is at the southern end of the main street. Limestone deposits and water have created the Waitomo Caves, northwest of the town, one of New Zealand's most-visited tourist locations. * Former Prime Minister of New Zealand Jim Bolger held the local electorate of King Country. * All Black Kevin Boroevich. * World Champion Sheep Shearer David Fagan. * Tony Martin, Australian-based comedian and author, was born here. * All Black great Colin Meads called Te Kuiti home until November 2007. The auction of his farm caused nationwide interest. * Les Munro the last surviving pilot from the Dambusters air raid was mayor for some years and has a street named in his honour. * Author Ruth Park grew up here. * Rob Waddell, Olympic gold-medalist rower, was born here. He is also known to have the fastest 2 kilometer ergometer time in the CRASH-B Sprints held every year in Boston.